Journal of Singing, the official journal of National Association of Teachers of Singing, reaches more than 7,000 NATS members five times per year. In addition, many libraries and students subscribe to this scholarly journal. 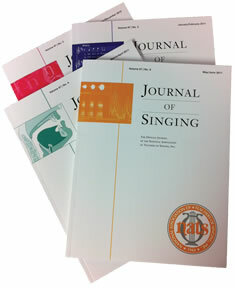 Journal of Singing is the only nationally distributed magazine devoted exclusively to the art of singing, vocal function, vocal literature, care of the professional voice, and the teaching of singing. It is the publication most frequently consulted by students and teachers of singing. With a circulation of approximately 8,000 and a readership of over 100,000, your advertisement in Journal of Singing is an effective way to reach teachers of singing with information about your programs, products, and services. Download the Journal of Singing 2019-20 Media Kit for information regarding pricing, deadlines, and guidelines for submission. Or Reserve Your Space Online!